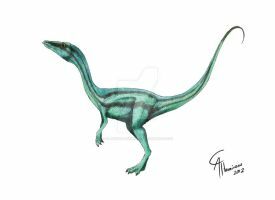 Ornitholestes has long been mired by uncertainty and inaccuracies. Long thought to be a species of Coelurus, it wasn't revived as its own genus until the early eighties. It's taxonomic position has long been disputed, but lately it has been suggested that it's actually more advanced than was often suggested. 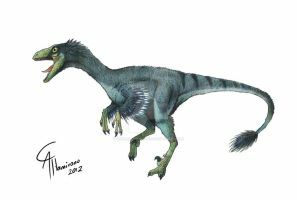 I really like the basal coelurosaurs like this dinosaur and Santanaraptor, same with the compsognathids. Didn't know he was reclassified! Awesome! The feathers are MORE than extremely awesome!!! Can I pick this color scheme for my JP fanfiction??? I frikkin LOVE this color scheme. Is it based on any living animal? i don't [i]think[/i] so but it's been a while since i did this, so i might have used an animal as reference and forgot. Well, looks like we know what the Flintstones had for Thanksgiving, eh?